Officers from West Yorkshire Police's Roads Policing Unit seized this car. A suspected uninsured car was seized by police. 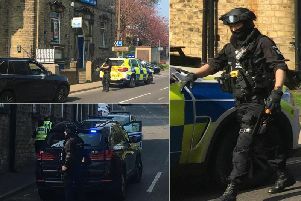 Officers from West Yorkshire Police’s Roads Policing Unit (RPU) attempted to stop a blue Mercedez in Halifax on Saturday. The driver sped off in an attempt to escape arrest but was stopped after he drove into a cul-de-sac. The car was seized after police suspected the driver had no insurance or licence.